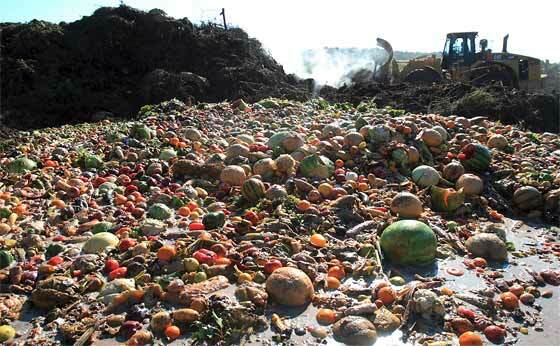 In the U.S., almost half of our food — 40 percent of what we grow — ends up in the garbage. It’s pretty amazing when you think about it. Today’s modern world is overflowing with the availability of food. There’s apparently so much of it, that lots get thrown out. We sure are spoiled in this regard (pun intended). Avoidable Food Waste is made up of food items that could have been eaten if they had been managed or stored better. The food may not have been fit for consumption at the time of disposal because it had gone moldy or had been spoiled or it may have been thrown away because it was no longer wanted. The Waste and Resources Action Programme (WRAP), a British nonprofit, conducted a detailed analysis of avoidable household food waste in the U.K.
From the garden (or store) to the table – food being a preparedness resource – should not be wasted if we can help it. We should develop habits that enable us to more efficiently utilize and consume what we have. Be aware of “Use-by” and “Sell-by” dates. I generally found this data to be interesting, although not surprising that so much food gets thrown out. One wonders what would happen if and when there are real food shortages. How many of you notice food getting thrown out? How often have I seen someone buy food for their kids (for example) and after eating a bite or two the rest is tossed out because they don’t like it. I’ve seen that a lot. I have known people that simply will not eat ‘leftovers’. They’ll toss it in the trash instead. What are your examples of food waste that you’ve witnessed? If you let it go cold it turns to starch. If you reheat it and eat it you are consuming muck that turns to sugar in your stomach. Just cook enough rice to eat fresh. Limit the amount of take away rice. Might I suggest a Rice Cooker, keep the rice hot for a few days, tis still good. Also, is the rice not starch to begin with, and hence turn to sugar anyways? I will agree 1000% with the ‘goo’ aka ‘muck’, but a hunk of cold rice, sometimes called Sticky Rice, is good for Sushi and a glob with Lettuce and little Fish Sauce. Seems as if I’ve worked all my life. I started working on a large farm when I was a child of 9 for 50 cents an hour. When I was 13 I went to work at a Mom & Pop grocery, meat market, and filling station for the same 50 cents an hour. All the grocery canned goods and dried beans, rice, etc. were priced with a 20% markup over what owners paid for them. Example, if it cost them 10 cents a can, they sold it for 12 cents a can. Fresh vegetables were marked up 100-200% above cost because of short shelf life and waste of unsold stock. I’m guessing that is similar to loss by the consumer of purchases of these items after purchase. Bread, at one time, was delivered fresh daily from bakeries serving customers within a comparatively short distance. Now bread may be several days to over a week old before going on the shelves. It no longer has the same flavor and does nothing but hold the filling of a sandwich, or serve as delivery vehicle for butter, jellies, or jams. It adds nothing to the taste. We prefer biscuits to toast and eat few sandwiches, so a loaf a week usually sees half a loaf fed to the chickens. On the other hand, home baked bread or rolls rarely make the end of the day before being consumed. It tastes great all by itself as a snack. Yes in the past bread was made fresh every day and now it is made maybe a week ago and shipped to the store to sit for a few days and then bought by customers and then sits for several more days. The old (daily made) bread was better, but it went bad in a day, 2 days at most. I have a bread machine (actually I have 2 of them) and when I make it, it does taste very good, but it goes bad in a day. I only make it a few times a year for just this reason, the work involved is high. Homemade bread is quite tasty and can almost make a meal in itself, but it’s a hassle to make it every day so I buy the bread that last for several days after I buy it. I bet most of us here like the fact that you can have bread every day and not have to buy or make it every 2-days. Convenience is a big factor for the bread maker and the customer. Modern commercial bread last much longer for a reason. Mostly it’s because of the fact companies don’t want to make a product to have most of it go bad before the customer gets a chance to buy it. They add things to the bread to help it last longer, nothing evil about it, just simple economics. It’s hard to blame a company that is trying to make money and not have their product go bad before you get paid for it. The school luncheon program is required by state health agency to discard leftovers, and there is an incredible amount of that as they are also required to offer a large quantity. A large amount of what is offered is not the type of food students will eat. This is a huge dilemma that needs to be resolved, but isn’t being worked on. How very true about food programs that encourage food waste. When the nieces were in grade school I worked there in the cafeteria to help out. The amount of food toss was disgraceful, but nothing we could do about it. State & .gov laws forbid saving any left overs for the senior citizens food bank or homeless. I believe the numbers you have quoted are the UK tonnage, correct, the US Numbers are HUGE in comparison. Makes one wonder if the food industry is someone lacking because of the abundance of food produced. Also if they toss out 40% does that not help keep the prices higher? Follow the Money. There are literally hundreds or thousands of acres of farmland turned under each year (or they just don’t plant them) of perfectly good foods because the Farmers get paid subsidies. As to your question, OMG, it’s amazing the food wasted in restaurants, for example the local Chicken Joint has timers on the Serving display, if the chicken is not sold in a XYZ amount of time it’s tossed out, period. They can’t even give it away. Bratty, Spoiled, Kids that dislike a food will just throw a temper fit and not eat. Oh course Mommy and Daddy will buy something else for these little shits to eat… Maybe Eat. Let me tell ya, if I had tried that, I’d be a lot skinnier than I am now. Wasted foods at Stores is amazing, if something has a littlest little spot on it, it’s tossed, Best By Dates, tons and TONS of food even locally here fill dumpsters every day at the Wally Worlds. Yeah, this is a subject that pisses me off HUGE TIME, $4.40 for a stinking head of Lettuce is BS, and I blame 90% of that inflated cost on .gov regulations, and keeping the price up, as you clearly said, 40% of food (in the UK) is dumped. Ya all might want to read the book “The End of Food”, quite the eye opener. Reading it now. Nothing I wasn’t aware of (yet) but he puts it together in an interesting and convincing way. I’m just through the historical/up to the present section (about halfway through). The End of Food is on Amazon for free under Kindle Unlimited. spent 8 yrs as a Mc Donalds manager. We always had left over pre-made breakfast biscuits. We wanted to give them to the local homeless shelter for their breakfast. Nope–health dept said no, someone might get sick. Health Dept made us put the food in a trashbag, and pour bleach over it before we thru it in the dumpster. I’m sure this was the same regulation all the other fast food places had to follow. That’s a lot of waste. It was a fine line to keep enough product in the bin to keep the drivethru times short and not wast copious amounts of food. Is NOT a friend of the people. It is pure and simple self serving bureaucracy. BTW, Leftovers at my place are eaten, given to Blue or the Compost Pile, nada and I do mean nada makes it to the Trash Dump. Even Bones are buried in the Garden. Having a good inventory list with Expiration Dates (Best By Dates are foolish) it helps with the Deep Pantry rotation, also inventory the Freezers and Home Canned foods. Use the food you work so darn hard to produce and buy. if your tpee has an expiration date, I will take them off your hands and destroy them of course! Composting. I have a compost pit (which will be going away as soon as Dad allows it!) and I started a form of bokashi last year. We put out our garbage can maybe every other week, the recycle bin about the same. I keep telling Dad to put the cardboard boxes and such in the compost. He looks at me like I’m crazed. 🙂 No food waste goes out of this house. That being said, these numbers include restaurant waste, subsidies, food that never makes it to the stores because it’s not pretty enough, etc. I think it would be interesting to see an actual breakdown, splitting those kinds of “waste” from actual consumer waste. One of our church sisters has many connections to orchards and produce suppliers. Several times a year we order from these suppliers. The produce (fruit & veggies) are all seconds. They just don’t “look” the best (think Kroger or Walmart) and can’t be sold to the big chains. That is how I purchase the peaches from the local growers around here. Referred to as 2nds but so much less than the “pretty fruit” for the city folk that do not know any better. I’ve been away from the hog farmers for a long time, but back in the day, many had restaurants that gave them their wasted food to feed their hogs. Government stepped in and required the waste be “cooked” (uniform 160 degrees throughout) before being fed to the animals. Some quit the practice, some bought huge rotating cooking drums to meet the government mandate. Has this practice stopped? Once I raised hogs for my family consumption and had a deal with a commercial popcorn plant to pick up their “screenings” (un-popped or partially popped corn that fell through the separators) once a week. Covered with coconut oil and butter, the hogs loved it. Guess that wouldn’t be allowed now, either. Interesting you bring up Hogs and unused “food”. A couple of years ago the .gov tried to put a stop to the Breweries selling or giving Hog and Cattle ranchers their “Spent Grain”, literally tones of perfectly good feed for Hogs.., this is the Grain that’s left over from making Beer, and is “cooked” as required. The reasoning you asked? Was because the .gov did not get their Tax Money from the “giving away feed”. BTW, the .gov lost that battle, but are still trying, always about $$$$ with the .gov, not about doing the right thing. When I was in boot camp for the Navy ( about 100 years ago ) we had big 55 gallon drums that we put all waste in and it was either given or sold to pig farmers. “sell by”, “use by” dates are government bs. Check the food and you will know if you can use it. Don’t just throw it out because of the date. I smell, taste, visualize all foods I plan to consume. If they past the test I use them, if not I find some other way to use them, ie. Compost, animal food, etc. No reason to waste anything. That’s my approach as well. If a fruit or vegetable is approaching overripe, I will usually dehydrate it or freeze it to use in soup or something. I am guilty of missing letting bananas get waaaaay overripe fairly regularly, but then they go in the compost bin. Oh Chipmunk, say it isn’t so. Bananas have to be way overripe to make a decent banana bread. Oh I cry when I think of them in the compost bin. I have to hide bananas if I have a taste for banana bread. You know the bananas are ready by how drunk the fruit flies appear to be, and yes the bananas will probably be oozing by this point. When I say waaaaay overripe, I’m talking not just oozing, but pretty much liquid. Never fear: if I catch them when they’re just oozing, I toss them in the freezer to make banana bread. There are many examples of wasted food that could be put to good use .A lot of it is because of stupid government regulations. Unfortunately governments grow larger and more regulatory over time . For the most part we are a throwaway society today, people won’t or don’t re use things . Having been brought up in a poor family I was taught to use and re use things for as long as we could. Money was scarce , we couldn’t just go and buy a replacement, We ate a lot of leftover food and we gardened and composted . We did not leave the table until our plate was clean. Waste not -want not makes sense to me . First 12 years of my life in Kansas, where citrus fruit was a special treat. Then moved to the PNW. When I was a teenager we visited family in Arizona. I commented to my uncle about how unbelievable it was that folks just let oranges, tangelos, and grapefruits rot on the ground in their front yards. He replied that it was no different than all the apples and pears rotting in yards in Western Washington. Perspective. Recently I packed my car with more than a hundred packaged bread products from the bakery outlet store. Cost just a few dollars. Guy in the next car over asked if I had pigs. Chickens! I replied. Only a couple items were past their pull date. Small chest freezer is full and the chickies get a treat every morning. We never throw food away. When we had a dog, she would get things that were close but still good. If the food was past that point, we would throw it outside for the critters, and we do get a few that make regular stops looking for scraps. These same critters could be a local food source when the SHTF, so its a win win. Only those who have gone hungry know the value of saving any and all edibles. I have been there more times than I care to admit. Most of us have been quite fortunate in life to have never really known true hunger, its easy to forget, and overlook that possibility. I think that is one of the biggest reasons why i put back food supplies, so that if something happens i know i can float for a while. I have a sneaky feeling that lots of us will be tested in that regard in the coming months or years. All its going to take is for the JIT system to go all venezuela and people will be rioting because their local safeway has empty shelves. Our population is huge, most have n clue just how close to disaster we really are. You are right on about that one. Just imagine those times when you get really hungry, I mean ‘really’! hungry (maybe a meal or two was skipped or working hard burning calories), and then multiply that! It’s no joke. We must sort out our food preparedness from Level-1 all the way to Level-4. I believe I can say I knew what true hunger was like for a while. When I graduated from high school, I was told I was on my own, and being from a poor single parent family (my parents were divorced) I was promptly kicked out. I lived on the street for a while, and would eat anything that wouldn’t eat me first, till I met my girlfriend (now my wife). She would give me her babysitting money till I got a job. Next thing you know, we got married. (50 years ago). Now, I always have a good garden, and never waste anything. All the surplus goes to my neighbors. I can, freeze, etc. all that we will need. Have plenty of meat, fish, etc. put up also. When you say “it’s no joke”, you are more right than most people know. They should try to see how long they can go with little to no food, and see how long they last. That would be a taste of real hunger. You are not alone,,,ACDH & both remember those days. We eat left overs & I make extra for the left overs as they are better the 2nd day. If possible will use the left overs- left overs to create another different meal, which does not happen very often. AND making a second meal from Leftovers… ohhhhh yeah. Ohhhh, now you have started it..LASAGNA,,,oh my..yum. Always interesting to read about Garbage Soup from Great Depression cookbooks and stories. A lot of useful information to be gleaned from them. Or as my Uncle used to say it’s not what you make it’s what you keep that counts. Both in money and food production and cooking. Learning how to really cook from scratch will open your eyes and save you money. For example some would buy a Rotisserie Chicken eat it and throw the scraps away. Some might think to boil it with a dab of vinegar and make an excellent soup with some noodles added. Some might see what they pay per pound for that pre-cooked chicken and go buy a nice roasting hen and for much the same cost as the pre-cooked one meal for two feed 6 adults. Skills best learned while you have a working economy. A TOPIC CLOSE TO HOME ,,,,,what we waste on the ranch/farm ,,,,waste this year ,,,left hay in the field 10 ton cut ,raked, not baled ,,grain not planted , cherrys not picked left to drop ,,pears left to drop ,, plums left to drop ,,neighbors apples left to drop ,huckle berrys left for the birds,three steers will possibly end up in the compost pit ,,why you ask? First off gov regs ,,second insurance and lawyers,,third people that think I should work for free for there benefit ,,forth big business taking advantage of monopoly to not pay a fair price to producers ,,fifth why take the risks and expense to plant /grow ,??? ,,,,,,,,WHO IS JOHN GALT???? AND WHY DOSE IT MATTER???? Don’t those swaths of hay make it difficult to work that field in the future? I can see your not wanting to feed the system of useless eaters, the corrupt, the government waste, …. but are you making it more difficult to remediate those lands, orchards, berry plots, … for your own future? Your not wasting anything, you are building your soil by not removing crops year after year. I’d be happy to trade for beef. Unfortunately all I have to offer right now is cash. There was a time when you could take a farm truck with a large tank to a local dairy and pick up a load of excess buttermilk/skim milk for next to nothing. The pigs loved it and put on weight like crazy. Nor sure if you can still do this or is it poured down the drain? The large corporate farm I worked at as a kid had it’s own dairy operation, feed lots, feed mills, etc. They had a large mixer truck that they used to mix excess milk with ground grains from their mill to make a slurry to feed the hogs with. Some of the best pork in the state. It was raw milk, as they sold the bulk of the milk they produced to a much larger urban dairy that processed it for sale in stores. Can anyone explain how Wally World sells hot rotisserie whole chickens for $5 (tasty, and a whole lot better bargain than a $5 hamburger by the way) in their deli and and sell their raw whole chickens 40 feet away in the meat section for $6 each? I think it is called a lost leader to generate a regular flow of customers in hopes of selling other items – usually placed so you have walk through the store (china junk aisles) to get the chicken. The story is that fresh chicken can only be kept for so long so instead of throwing out the unsold ones they put them in the rotisserie, which is cheaper to operate than a total loss. This, in fact, is the purpose of having rotisserie chickens there. Walmart has to dispose of those after they are 4 hours old, so if you know the shift you can get one for even less. Easy, the rotisserie chicken is the old whole fryers they didnt want to throw away! Just like the prices on most any meat, which means you better consume it that day, maybe the next, otherwise it will ‘stink’. It’s ALWAYS about the money. I haven’t noticed any bacon here ruining and I keep it a long time before cooking. However, I do buy 4 pkgs. at once and cook it in one setting–in the garage on a table with two eyes on the camp stove…heat stays in garage and mess is minimal and who cares?? I then freeze all I don’t use; when thawed, just like fresh fried. Dennis, I think the Rotisserie chickens come from china, frozen. Several times over the years I have been a food server. Wow, the food that was thrown away. Used to really bother me. At the Hyatt back in the 1970’s I worked in the revolving restaurant at the top. On the menu was a 4 piece sandwich divided onto the two sides of the plate. Many times I put the un touched side in a napkin and brought it home. Times were hard then for a single mother. Hope this does not gross out some folks. Just is what it is. Did not go to waste. Holy Moley. I was testing and shipping Paveway’s, MK-85 guidance systems, for the USAF at the same time while I was at Tiny Income (AKA Texas Instruments) at US 75 and I-635. Did you ever notice any ‘sparklies’ on the ball? When I was in R&D we used to illuminate the ‘ball’ with infrared lasers to ascertain the operational characteristics of the system. Never went to the restaurant though. Too many bucks for a ‘tiny income’ type. And yes, we sometimes saw strange colored illumination on the north side of the ball. I knew the man, an electrician by trade, whose full time job (under contract as a small business) was replacing burned out bulbs on that ball. Dangerous job, but paid well. Dennis, ha ha, no in Tennessee long time ago. Was a huge deal back in the day and I think the fancy prime rib dinner was $11.99……………………. Yep, definitely not the same place. The $50 meal was on the low side of the menu. Filet mignon as I recall. Tiny portions, we went for a hamburger after we left because we were both still hungry. Thanks for the article Ken. Let me start by saying to people: Look at the members of your own tribe/family/room mates. Start by fixing food that others will eat. Most food waste I see is from finicky eaters and folks that try very hard to appease the taste of their youngsters. This last example is a very tough job for young parents these days and I do not envy them. I was the youngest of 6 and I went to work at a low level govt. job that was low on the pay scale. I bought 1 whole chicken per week and used every bit of that bird including the bones roasted in the oven and used for broth. On top of this, I grew up around farms and ranches and worked as a prep cook and baker when I first went away to college. I ended up marrying a gal that was born and raised in the city and her father called her “princess” and she believed it. She was only child and her tastes reflect that. She shops at high end grocery outlets and will NOT eat at certain ethnic restaurants. She gives me grief about some of the canned food in our garage “going bad”. without checking the dates on top of the cans. Food waste is a complex topic in this house and it does raise arguments One can only imagine what this conversation would be like within a household of finicky eaters. With a dog around, one has minimal use for a garbage disposal. Just be careful not to give dogs onions, alliums or grapes. ( bad for their system. ). My dogs favorite kitchen appliance? the grill. I have to agree with that, with the addition of the Smoker, ole Blue knows for a fact he’s getting something from the stash. Chuckling at your comment. My family says I have a cast iron stomach, I’ll eat anything. I do, after all snack on jalapenos with horseradish sauce for a dip. They are more particular in the food they eat. Whoah, Dennis — you are a food warrior! Jalapenos with horseradish??!! Googled the recipe. Sounds good. Already eat jalapeno poppers made with cheddar stuffing. The cream cheese mixed in sounds larapin’. (a little down south lingo). Got the recipe now. Come on all, jalapenos hot???? Nope, Thai Dragons or Ghost Peppers dipped in a nice Cheese Fondue…. I eat fresh green jalapenos, but really prefer the pickled for snacking. Pick the red ones and string them up to dry (or dehydrate them) then crush them up and use them to sprinkle over salads or to garnish other dishes. Don’t recall saying I thought jalapenos were hot. I just said I love them for snacking on, especially with horseradish sauce. I’ve eaten ghost peppers and really didn’t think they were any hotter than chili petin peppers. Once either of them set your mouth on fire, you’re hard pressed to tell the difference. We use a couple of crushed green buckshot size petins to put some bite in a 3 gallon pot of chili. We ain’t suicidal. Speaking of good hot peppers, there’s a new cayenne pepper out called Dragon cayenne. They’re twice as big around as a regular cayenne, and the meat is thick like a jalapenos. A little hot though, but makes a great pot of chili. Hard to find still. Grew my own last year and this year. Maybe related, maybe not, but I just received a call from one neighbor that a “weekender” (who is also a really good friend) killed a deer this weekend that was badly infested with worms. I’m waiting for a call back from the friend who killed the deer to get a better idea about what type worm infestation (intestinal or in the meat). Supposedly (second hand info) the game warden was called and friend was issued a replacement tag and deer sent to lab. My first thought is the practice of some, that has become quite popular, of baiting bears with food garbage/discarded ice cream may be a the root of it. For those that think it can not happen here – that picture at the top looks like some we saw from Venezuela a while back – people at the local dump looking for food. When the transport trucks stop for whatever reason, hunger is guaranteed to follow. HU, and that’s when people will stop throwing away so much food. During the depression, ranchers destroyed 100’s of thousands heads of cattle (if not millions) because the market was flooded and folks had no money to buy. Same with food crops. If memory serves, the government paid for it in an attempt to bring prices up to the level of production costs to try and prevent them from going out of business. In the 30s my Grandfather told me that the government came out to his ranch in West Texas and shot 2/3s of his cows, bulldozed a hole and buried them so they would not be on the market, he did not get to select the cows to be shot, they shot them at random. He said that pretty much broke him of ranching as he and his hired hands had burned pear all winter to feed them. I guess I got my fondness for government from him! Im surprised the govt goons didnt get shoved in the hole with the cows. That would have of course been an insult to the dead cows. If proper management was implemented in order to can that 40% for .gov surplus, instead of letting it go to waste, the U.S. could be stocked with a descent supply should the need arise. That possibly could mean more jobs, allowing more people to work their way off of gov. assistance. Or a barter program with countries that need food, and that have natural resources that we need. I hate to waste food, especially when I have grown it. I can all kinds of things. And if it does go bad before I do something with it, my deer, the livestock as old man calls them, eat well. The deer remind me of the younger generation today. The older ones eat fruit and veggies and of course oreos. The young ones won’t touch it. They want bread, rolls and goodies. Just a note, old man is out of surgery and i am waiting for him to call. thanks four your thumbs up. 50 thumbs up for rhe “young man”. Years ago I worked in a food distribution warehouse for a while. It was amazing the amount of food wasted every day. For example, if one jar of spaghetti sauce or apple juice was broken in the case, the whole case was thrown out. The only things that were saved were a few dry goods. The damaged container was removed from the case and then placed in a trailer where the goods will be sold at a discount. Employees used to be able to buy damaged cases but was stopped when people got caught purposely damaging things so they could buy that item at discount. So, if a case of apple juice had 6 jars and one got broke, the other five were thrown out. Couple of years ago I gave one of the newly moved in locals a few jars of pickled okra and pickles, he came back the next week and told me his wife had thrown them in the trash because of the expiration date on the canning lid was two months past due. The date of course was the date it was canned, barely ready to eat. She was another never had to make her bed princess. Last goodies for them! Ohhhh that would be irritating, and the fact Ms. Princess did not think to return the Jar and Ring…. UGH!!!!! Ya just cant fix Stupid ya know…. I have changed over to Freeze Dried Foods, mostly Thrive Life (Good Experience So Far). Makes the waste less but also increases the productions costs. Considering the lack of produce in my area it is a no brainier. Typically here you can’t just go to the store and expect to buy a melon, bell peppers, green onions, celery or tomatoes. If your lucky they might have one of those. I am surrounded by farmland but they produced grains and livestock for sale and that is it for the most part. Being out in the Countryside is great but it has its challenges too. Sounds like a business opportunity to me. How much land ya got? Can ya lease 5 acres? Find out what the people in your area ‘go to town’ for. And grow it. Betcha there’s a bunch of kids that would like to make a few bucks weedin’, pickin’, and packin’. Just don’t call your effort a ‘store’. You don’t want the city, county, state, or feds in on it. Just put up a shed and a few tables. Lucky to be out in Countryside. The City and County would not be an issue. The State and Feds would never know if you keep it quiet. I am looking to buy a little Homestead in a year or two. Waiting for the market to go down. Hopefully when it goes down it won’t be on fire. We view it as a tragedy when good food goes to waste be it through poor menu planning or the idiosyncratic ways of Govt. agencies. A good challenge for each of us may be to go out and try to fix something different each week and start creating a list of things we like versus things we do not care for. I know from retrospect that I did not know how to cook Mexican Food until I left home and lived in a neighborhood surrounded by Mexican people. Many will not show the asian guy how to fix chili peppers but eventually, somebody will help out the poor bewildered asian gringo. Another part of making it through hard times was learning to eat what the locals ate because the base ingredients are available locally, they are affordable and they are generally nutritious and good for you. Learning to cook and being willing to try new things has been another trait that allows one to “survive” if not thrive in changing circumstances. Great comment, and yes I know Ken is using Thumbs Up to relay that, but this is an extremely good comment. Learn to eat as the locals eat, excellent advice. Chinese hot mustard. It is more hot than wasabi ( most of which is actually green tinted horseradish here stateside) and I usually cut it with some soy sauce. Generally not given out with Chinese food so you must ask for it. When you do, the owner/cook proprietor may look at you like some crazy Guai-Lo. The food from the northern Chinese provinces tends to be really hot using lots of peppers. The fact that you are already eating ghost peppers, jalapeños with horseradish sauce means you are already qualified as one crazy Guai-Lo. ( I have noticed this trend among motor officers retired or still working. Like to live dangerously perhaps?). I think the only place you may find REAL wasabi in the US is in or near Tommyboy’s neighborhood. Real wasabi costs at least 4x more than the imitation stuff sold stateside. I will leave you to eating the hot peppers. If I tried to eat that stuff, my stash of TP and pepto would rival that of NRP’s warehouse in the desert. Agreed on the Chinese hot mustard, brings tears to the eyes if not careful, but such a wonderful flavor.